Having to give up coffee some years back meant I could no longer enjoy my daily fix of Kopi-C Ka Dai and Cafe Latte. It meant I had to join children, old folk and invalids in sipping Milo while everyone else had their kopi. And while I could sit at a coffee joint and smell the coffee, I’d have to content myself with hot chocolate or a pot of tea. Sigh. “Catching up over coffee” has never been the same. So the discovery of Chai Latte was of much comfort to me. With its heady, spicy, aroma so uplifting, and milky sweetness so pleasant to the tastebuds, it wasn’t a bad consolation prize at all! However, it soon became apparent that this drink was not catching on here the way I’d hoped it would. 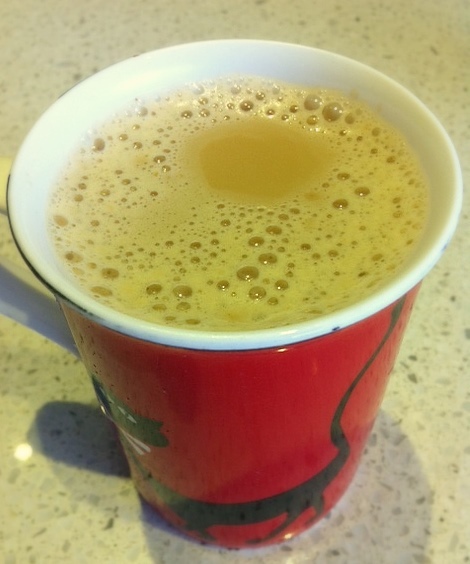 A cup of Chai Latte is still not easy to come by in Singapore, let alone a good one. 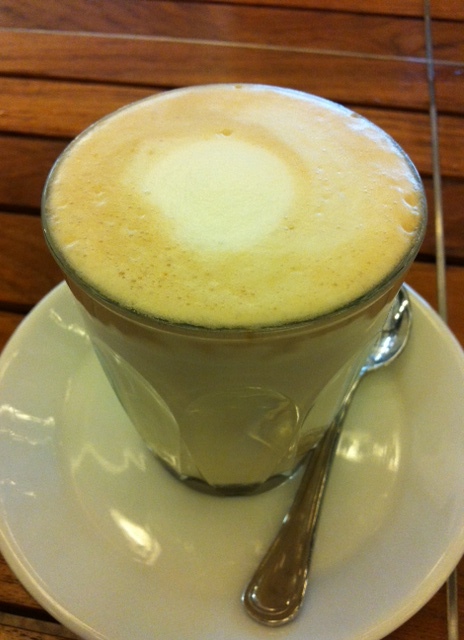 Recently, Brunetti opened its doors here for the first time, and brought along with it, its Chai Latte! Same way it’s served in Melbourne, in that little latte glass, and just as good! It was a nice change to have the server nonchalantly note my order, since it’s more usual for my request for the drink to be met with a quizzical look. And then over the New Year, while having breakfast at The House of Robert Timms (at Wheelock Place), I was excited to find that they too had it on the menu. And it wasn’t half bad either. So there is hope for me yet. Perhaps it will finally catch on. Perhaps I will no longer have to go up to the counter and quietly order hot chocolate, feeling like the word “loser” is emblazened across my forehead. Today I tinkered about a little, trying to make some Chai Latte. And it worked out pretty well! It felt indulgent to be sitting at home, sipping a cup of the milky, sweet stuff on a Tuesday afternoon. For all you coffee-drinkers, this is probably completely irrelevant, but for the sad bunch like me who have to stay off coffee, you may like to give this a shot. In a saucepan, boil teabags with ginger and spices in water for 8-10 minutes. Add sugar, then add milk and bring to a boil. Strain into cup and enjoy. Makes 2 small coffee mugs’ worth.